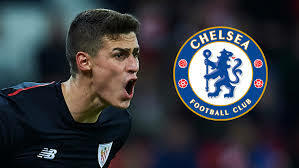 Chelsea are in advanced talks to sign Kepa Arrizabalaga from Athletic Bilbao for a world record fee of £71m. Kepa is Spain's number two behind Manchester United's David de Gea and has one international cap. He has spent the past two seasons in Bilbao's first team, making 53 La Liga appearances. The 23-year-old would be brought in as a replacement for unsettled Thibaut Courtois. The deal would surpass the fee, believed to be up to £66.8m, that Liverpool paid for Alison in July. Belgium international Courtois, 26, has yet to return to training and is linked with a move to Real Madrid. When asked about Kepa after Chelsea's pre-season win over Lyon on penalties on Tuesday, Blues manager Maurizio Sarri said: "I saw him one year ago. My first impression was that he is a very good goalkeeper, very young, but very, very good." Should the deal for Kepa go through, it would be a club record purchase for the London club, surpassing the £58m they paid Real for Spanish striker Alvaro Morata last summer.